Events this month will make you think about how much you respect yourself or how others respect you. You will begin to separate yourself from people or situations where your talents, efforts, or yourself as a person are not respected. That is why this is often a month of job changes, not so much for money as you may even take a pay cut to work somewhere where you are happier and respected. In some cases, Aquarians may storm off and almost cut their nose to spite their face on a matter of principle – things like trust, respect, and values matter to you a great deal, and you will need to distance yourself from those who are not on the same page as you on those matters. Often by allowing others to treat us in a certain way, we set up a pattern where they begin to feel that their actions are OK; they may not get the subtle hints you send out that you are not happy with the status quo. In March, you need to be more blunt and forceful about what you want and need from others; press for your needs to be met and reverse patterns where you give and never get. Think more about what your needs are and why you are sacrificing your happiness for the sake of stability, especially in relationships. It is time to take the risk of upsetting someone: a boss or a partner to get them to wake up to the fact that love and life is a two-way street. March is an ideal month for new diets and changing habits to improve your health. You can be self-denying in March, and this can be a great help regarding diet, fitness, and if you want to quit a habit. At times in March, you can act compulsively; it is almost as if something bubbles up from the subconscious and takes over you for a period compelling you to either say or do something. Often what has been repressed comes to light, and it can be a big relief to have it out. It is not a good month to try and suppress any anger or strong feelings as they are going to erupt. This month is tricky for romantic communications; you need to be very clear about what you say and what you mean. This month, arguments will happen not over what was said but over what your partner THOUGHT you meant. The thing is that neither of you is listening; you are making assumptions. There could be two factors; either you only listen with half an ear, or it could be a matter of trust where you think that he/she says one thing and means another. Trust is at the heart of many communication problems. This is the case especially in long-term relationship where you know each other very well and almost know what the other is thinking – this month you need to listen to what is being said rather than relying on old habits and previous experience. Relationships are dynamic, and people can change, and that is why this month you cannot make assumptions based on past experience; look at everything afresh. 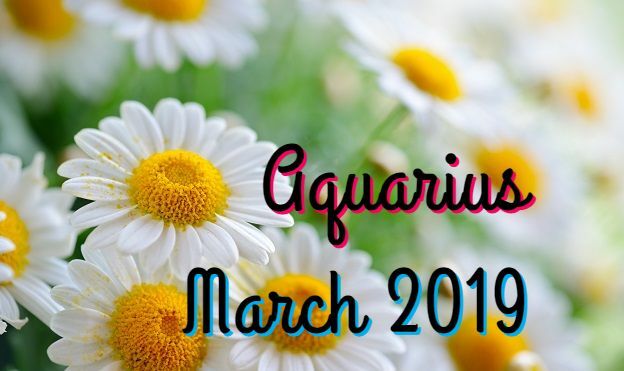 Aquarians are undergoing many internal changes this month, and that is why you may need to explain yourself or changes in your behaviour may seem suspicious. One problem this month for new and older relationships is that there may be conflicts between your respective sets of friends – where dates for social events clash, and arguments ensue. This is not a good month for meeting new partners on dating sites, dating apps, or newspaper ads. It is far better for face to face meetings, especially via work or study-related events. This is an excellent time for planning how to grow your business. You need to focus on social media, linking with similar businesses, being more involved in the community and also perhaps bidding for government contracts. You are highly motivated and also practical in the way you approach new investment or growth. You can manage future goals without becoming so involved in them that you neglect current priorities. You have a great deal of balance in the way you approach business decisions, and that makes this a wonderful month for major decisions. This is also a very opportune time to change jobs or positions; this should not involve a major career shift, rather a new job with a better pay structure and benefits or a department change which offers better long-term progression. If you have waited for a very long time for a position you desire to come available, this may be the month it happens. For those who are unemployed this month, you should redo your CV/resume and do a concerted blitz on employers. You do need a clear strategy of applying, following up, and preparing thoroughly for interviews. You will tend to have greater success with job applications this month as you can separate real opportunities from those which are no-hopers and so will streamline your energy to the openings with the best likelihood of success. Aquarians may be more involved in work which involves popular movements in politics or the arts.